An illustration for JRR Tolkien's The Lord of the Rings. This was done at the request of a good friend who is a huge Tolkien fan. It was quite a challenge, but luckily she had lots of good tips and gave me lots of encouragement. 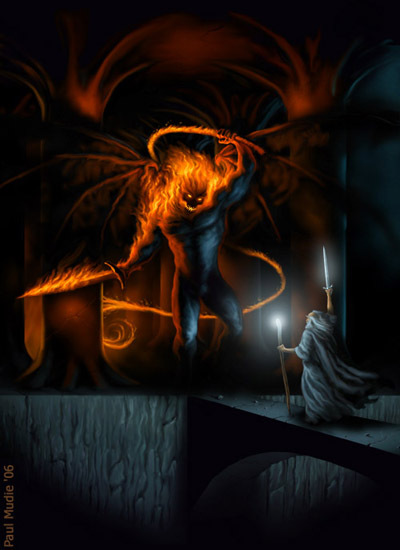 I had particular trouble with the Balrog. I wanted to keep away from the cinematic renderings we've seen and go back to the book, but Tolkien's description is open to a certain amount of interpretation. I tried out various things in pencil sketches before settling for what you see on the left.